The Yakthumbas are commonly called the Limbu people. 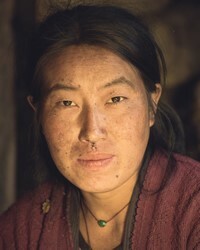 The Limbu are a sub-group of the Kirant people. They speak a dialect of Kirant which is a Tibeto Burman language. The origin of the Limbu is uncertain, but they are clearly of Mongolian descent. In the later part of the 1700s, Nepal was formed by uniting various ethnic groups and principalities under a high caste Hindu dynasty. 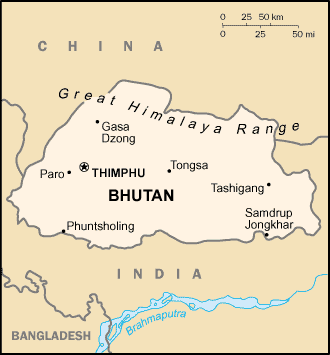 This conquest resulted in ethnic and cultural splits with the Limbu. There are 13 Limbu sub-groups. Legend says that five of the groups came from Varanasi, India and the other eight from Lhasa, Tibet. There is no social discrimination among the Limbu sub-groups, although there are a number of different clans and sects. The Limbu live mainly in eastern Nepal between the Arun River and the border of the Sikkim state in India. They have a significant population in India, and a small one in Bhutan. Agriculture is the main source of income for the Limbu. Rice and maize are their principal crops. Although the abundance of land has made cultivation of new acreage possible, productivity is greatly limited by insufficient technology. Excess crops are often traded for food that cannot be grown in the region or for necessary items. The men generally plow the fields and the women plant the seeds. However, at harvest time, both men and women work together to bring in the crops. Extended families often unite to help each other during harvest time. In the past, marriages were arranged by the families. Neither the bride nor the groom had much say about the marriage payments or ceremonies. Modern times have changed this; today, both parties have an opportunity to make decisions about the wedding. There are three types of legal marriages: adultery, arrangement, and abduction. In the case of adultery, a compensation must be paid to the previous husband. Women are quite influential within Limbu families, especially if the husbands are in the military and stay away for long periods of time. However, a woman is not fully recognized until she bears her first child. Drinking and dancing are very important to the Limbu. Weddings, mourning, gift exchanges, and settlements of conflicts all involve much consumption of liquor. Dances are held if visitors come to the village. These affairs give the young people a chance to meet and enjoy dancing and drinking. The Limbu society is patrilineal, which means that the line of descent is traced through the males. Related families make up clans. When a clan member dies, the entire group is considered polluted. They then must all go through a period of re-purification. The Limbu are predominantly Buddhists but participate in many popular Hindu festivals. They also have a number of worship practices that involve blood sacrifices. They believe that when a woman marries, she inherits her mother's gods. The woman and her husband then recognize the deities as their household gods. Fortunately, there are some Limbu believers who can be Christ-bearers to this people group. The Limbu people need the hope and joy of knowing their Creator and following the Savior who alone can forgive sins and direct their lives. * Pray for a "Book of Acts" type of movement to Christ among the Limbu people in Bhutan. * Pray for the Limbu people to understand and embrace that Jesus wants to bless their families and neighborhoods. * Pray for Holy Spirit anointed believers from the Limbu people to change their society from within. * Pray for a movement in which the Holy Spirit leads and empowers disciples to make more disciples. * Pray for a movement of Jesus to heal and strengthen Limbu communities. https://joshuaproject.net/people_groups/13065/INView Yakthumba in all countries.